My intention for my work is to support people in taking their best next steps in life, and to be supported in doing so. It is a joyous adventure, as I never know what will present itself for healing. There are so many layers and such complexity. I do know that I have a “contract” with the Source of my work which goes like this: In exchange for never editing information, I am promised that I will never be led to do any harm. At times, the information that has come through during a session has made me expect that a client will never return, but that has never been the case… so far. 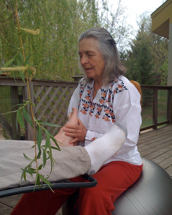 My initial training in reflexology began in the early 70’s, when people were experiencing injuries as we worked to build homes and gardens on Bubbling Springs Farm, our intentional community. While I understand the workings of reflexology, I have evolved into much more complex work, realizing that there is no way we can ever grasp the interconnected complexity of us most amazing creatures, human and otherwise, but especially humans. I call this work AcuRelease. Typically, my clients relax in a reclining chair while I am seated on a ball, and I can work most anywhere, but I love most of all to be out on my deck, under the weeping willow with the birds and plants. I have a sunroom for indoor work, and I do make house calls. I have the honor and pleasure of being invited to do my work in other settings, and annually work with my daughter Andrea’s yoga students on their retreats, especially to beautiful warm eco-resorts in the depths of winter. AcuRelease is generally very relaxing, but it can also be intense at times as I am called to break up stagnant chi, or life force that is not freely flowing. Stagnation creates pain and impinges on life quality in many ways. Sometimes this involves waking up old stored emotional aspects and difficult memories. It is amazing to me still to see how quickly these can pass through and release and clear. Perhaps the most intense work of occurs during end-of-life sessions, when I assist a being out of life in the physical form. I consider it an honor to work with those who are passing on, and see it as a sort of spiritual midwifery. With animals this process is quite brief and straightforward, but with humans it can be a longer and more complex process. Always there is calm and peace associated with the transformation. Whatever point we are at in our lives, from birth to end of life, we have extraordinary opportunities to learn, heal and transform. I see supporting those processes as being at the core of my life work.